(Bloomberg) -- Oil prices jumped higher after U.S. Treasury Secretary Steven Mnuchin signaled a truce is possible in the trade war with China amid multiplying threats to global crude supplies. Futures gained 2.5 percent in New York on Tuesday. The White House may remove tariffs on Chinese goods if Beijing presents sufficient concessions, Mnuchin told Fox Business Network. The remarks came just hours after the U.S. announced penalties aimed at ousting Venezuelan President Nicolas Maduro by strangling the country’s crude exports. In response to the sanctions, Valero Energy Corp. and other U.S. refiners began stocking up on Canadian crude that’s similar in quality to Venezuelan oil, while Venezuela’s state-run oil firm began asking for upfront payments from refineries. “You’re getting a little bit more of a security premium built into the price today," said John Kilduff, founding partner of hedge fund Again Capital LLC in New York. “As more of the details emerge of Maduro standing tough and trying to send the oil away from Gulf Coast refiners, and the Trump administration planning to freeze bank accounts and lock up opposition, the situation is on the boil." With bitterly cold weather forecast for parts of the northern U.S., a boost in home heating oil demand was also supporting oil prices. Diesel futures rose 3.3 percent to settle at $1.8975 a gallon on Tuesday, enjoying their biggest advance in a month. West Texas Intermediate crude for March delivery rose $1.32 to $53.31 at the close of trading on the New York Mercantile Exchange. That regained most of a loss Monday triggered by signs of slowing economic growth. Brent for March settlement climbed $1.39 to $61.32 on the London-based ICE Futures Europe exchange, and was at an $8.01 premium to WTI. U.S. President Donald Trump’s campaign against oil producer Petroleos de Venezuela SA is intended to bolster the position of National Assembly leader Juan Guaido, whom Washington has recognized as Venezuela’s interim president. Guaido said Monday he would take control of the country’s accounts abroad and appoint new boards to PDVSA and its Houston-based subsidiary, Citgo Petroleum Corp. The sanctions will see global oil flows rerouted. Refineries in China and India are the only ones that can process Venezuelan crude outside the U.S., Eurasia Group analyst Risa Grais-Targow wrote in a note. PDVSA will have to “deeply discount” its oil to displace Middle Eastern crudes in those countries, she wrote. 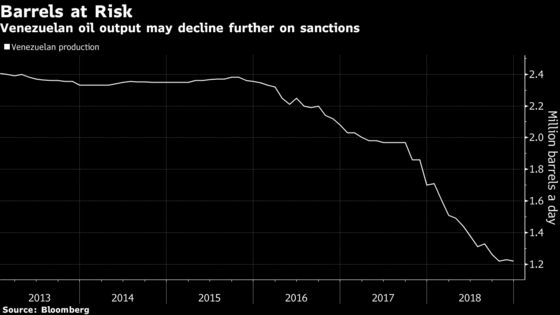 Valero and other U.S. refiners should expect a sharp reaction to U.S. sanctions on Venezuela in the form of immediate oil-export curtailment. While the sanctions contain a wind-down period, banks, shipping companies and traders often react by immediately refusing to operate with companies targeted by U.S. authorities. Companies still operating in Venezuela, including Chevron, Halliburton, Schlumberger and Weatherford, face a thicket of immediate compliance risks, despite a July 27 wind-down period, and may pull out of the country earlier. Venezuela, holder of the world’s largest oil reserves, has already seen output fall to just above 1 million barrels a day from more than 3 million in the late 1990s. A recovery will take time, Goldman Sachs Group Inc. said. On trade, Mnuchin said “everything is on the table" ahead of the latest round of negotiations, set to begin Wednesday in Washington. Still, Trump’s team remains divided, with hawks including Trade representative Robert Lighthizer seeking tougher terms from China, and Mnuchin and White House economic adviser Larry Kudlow prioritizing preserving U.S. growth. Gasoline prices rose 1.3 percent to $1.3509 a gallon. Any meaningful interruption in trade with Venezuela could trigger a test of the country’s domestic storage capacity and lead to further production declines, RBC analysts wrote in a report. Exxon Mobil Corp. has decided to expand a Texas oil refinery by more than 65 percent, making it the nation’s busiest, as surging shale oil production from the Permian Basin creates an abundance of light, low-sulfur crude.